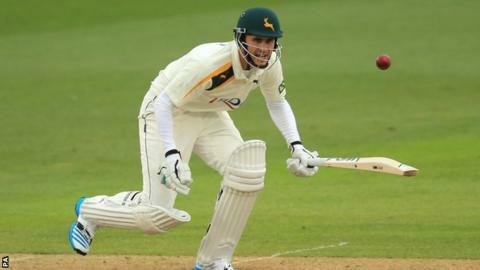 Nottinghamshire have recalled batsman Alex Hales from a loan spell at Worcestershire after only one match. The 25-year-old England Twenty20 opener, who made 15 and 63 against Glamorgan last week, was originally due to spend a month at New Road. He was recalled to Trent Bridge after Steven Mullaney suffered a back muscle injury while bowling in the nets. And Hales was expected to be named in the side for Sunday's Championship Division One game against Northants. "I felt a bit of pain in my back while I was bowling and put it down to cramp, but the last ball I bowled tightened it a bit more," 27-year-old Mullaney told the Notts website. "I'm pleased for Alex although it's obviously unfortunate for me to miss a game because I always want to be involved." Mullaney hopes to be fit for the county's T20 Blast opener against Lancashire on Friday. Two months ago, Hales became the first England player to score a hundred in a T20 international when he made 116 not out against Sri Lanka. However, his Championship form last summer was poor and he played only one of Nottinghamshire's first three matches of the new season before the club allowed him to join Worcestershire.